Earlier today some kind of sock puppetry was spotted in a Teams I'm in. Shortly afterwards the disruptive behavior stopped, and the involved Teams accounts were gone. I meant to answer this earlier, but it slipped my mind. Since the Charcoal Team is kind of a testing ground for whatever comes to mind, I used it as a testing ground for mod tools, doing the kinds of things that would get Nick Craver yelling at me if I did it on SE proper. No, you can't delete (or destroy) the Community user. Sad face. Yes, you can suspend the Community user. It doesn't... yet... appear to have any adverse effects. More on point, it's been SE policy for a while now that users that have been Suspended in the past year are ineligible to become moderators anywhere on the network. Does that mean that it's time to take that ♦ from Community and keep it away for at least a year? Not the answer you're looking for? Browse other questions tagged support stack-overflow-for-teams community-user account-suspension . Community's test comment can't be removed? Is there anything appropriate community members can do, to lift another users penalty box ban? 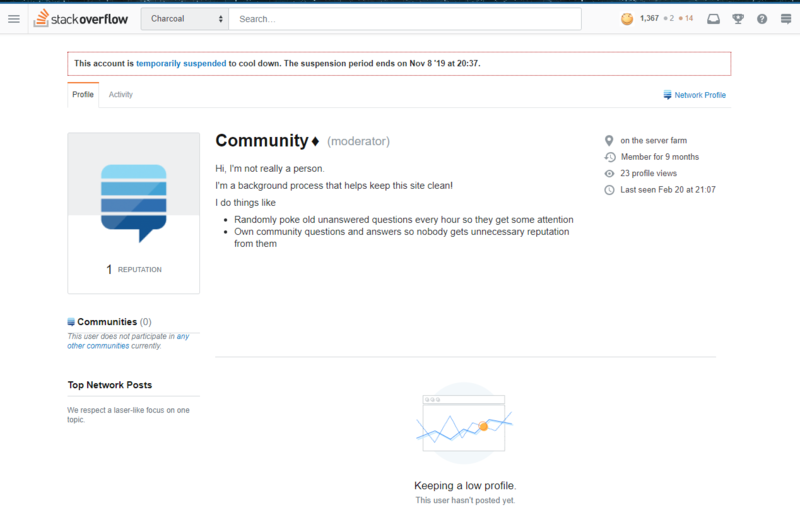 Transparency request: why was this user suspended for posting two (now deleted) questions to meta? How can I check how many times I've been suspended? When/why would voting fraud NOT result in a suspension? Do I require the approval of the owners of all teams I am or have ever been a member of, to merge my accounts?